Alhambra guitars have introduced a few new models for 2015 under the common denomination of “S Series”. One of these newborn Alhambra guitars is the Alhambra CS-LR CW S Series, the entry-level model of the Crossover line of Alhambra. As the Alhambra CS3 CW, described in a previous review here, (also being upgraded this year) the ‘crossover‘ models of Alhambra, have adapted some dimensions of the instrument to better meet the needs of guitarists who are used to playing on electric or acoustic guitars (the neck, the body, …). Thus, the thickness of the handle has been reduced as well as the size of the body, which has in addition, the presence of a cutaway. In this way, the guitar still keeps, very convincingly, the sound of a nylon string guitar, but offers a modern “makeover”. Even for an amateur guitarist, the very name ‘Alhambra’ is enough to evoke the image of Spain and its typical music. Of course, this is not enough to guarantee the quality of the guitars produced, but Alhambra has consistently demonstrated the qualities of the brand. From the most economic category to more expensive ones, customers always get great value for money, and the guitars are built to be played throughout a lifetime. One immediately sees that this guitar was built with consciousness and attention to detail. All the components are in place, the frets finishing is neat, and guitar carries a number of fine features. For example, in the case of wooden fillets whose color contrasts nicely with the rest of the woods in the guitar: the Alhambra CS-CW LR S Series, ash fillets are highlighted by a small line of ebony. These are the delicate details that make a difference. The traditional Spanish head has golden machine heads whose pegs are made of quality white plastic. This head is made of mahogany, like the rest of the neck, and it is covered with a small rosewood veneer. From a technical point of view, the neck is similar to that of the Alhambra 4P S: the actual neck is one piece and is glued to the heel and head ends. In short, a good old well-known, proven and well established Spanish guitar neck. 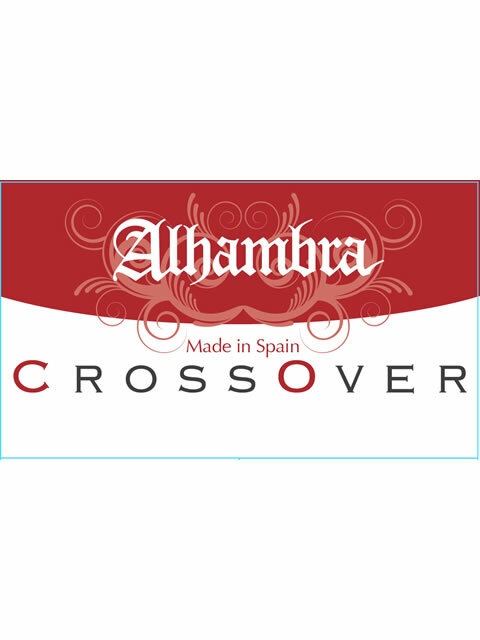 The neck of the ‘cross-over’ model is clearly narrower than the one on the Alhambra 4P, and it tends to have a C profile other than the traditional D profile present in many classical guitars. None of those changes will encourage electric and acoustic guitarists to turn more readily to this guitar, but it will make a more comfortable and easier transition. Indeed, such dimensions for the neck are much closer to those of their preferred instrument. In this way, Alhambra tackles one of the most delicate points (for electric guitar, of course) during the “transition” to a nylon stringed instrument. If the neck of this ‘crossover‘ model is a little narrower than the 4P S, obviously, the fretboard is too. But the differences do not stop there. 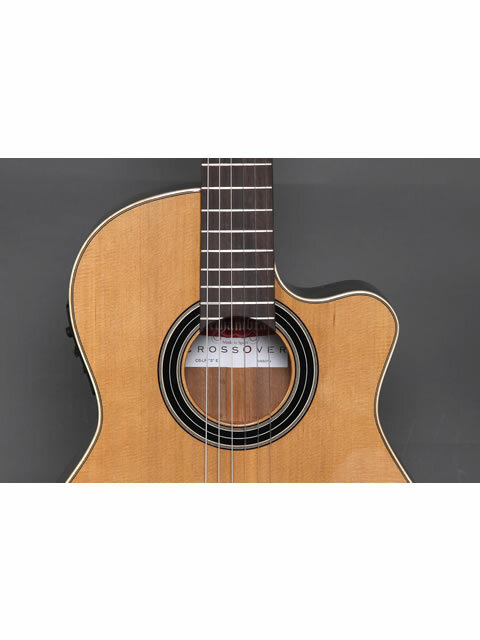 Unlike the flat fretboard of a traditional classical guitar, the fretboard in the “crossover” has a radius which is similar to the fretboards on electric and acoustic guitars. That will also please the acoustic and electric guitarist and it will also give a refreshing alternative to the most adventurous nylon guitarists. The fretboard in the Alhambra CS-CW LR S Line is made of carefully selected rosewood and as stated above, is impeccably finished with lovely and precise fretwork. Essentially, the body materials are identical to those of the 4P S, except for the fillets and wood inlays which have already been described. So, rosewood for the back and sides, and a solid cedar soundboard. The sides, like the back of the guitar, are highlighted by a wooden fillet outline, which adorn the heel in the same way. With these details, this guitar has a classy look. 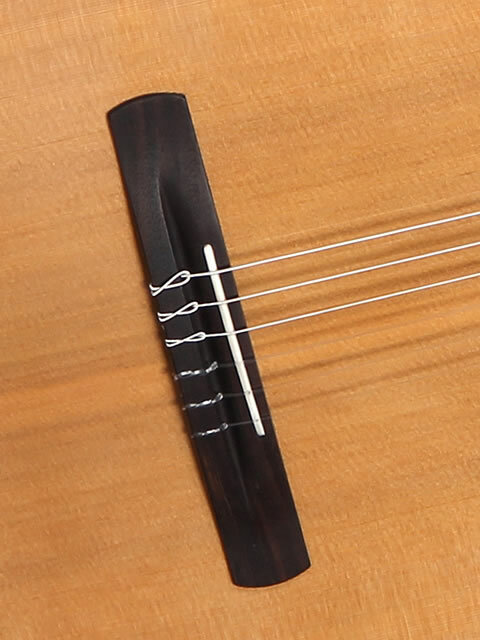 In the body of the instrument, the user actually feels that the crossover is smaller than a normal classical guitar, although expressed in millimeters, the differences are minimal. The cutaway is an addition which many classical guitarists do not even want to hear about! But once again, for an electric guitarist, this is the most natural thing ever! This is obviously one of the most important subjects up for discussion, and depends entirely on everyone’s personal preferences. This ‘crossover‘ offers an alternative which many classical guitar builders have not, until now, wanted to offer as a solution. Designing a neck that is a little narrower and a fretboard a little more “readable”, has made for a more fearless transition for those guitarists who would fall back immediately on their usual instruments , without the presence of these “facilities”. The body shape of the cross-over is, from an objective point of view, ergonomically more refined than a typical classical guitar: it fits more comfortably against the body of the musician, and the cutaway provides a host of additional opportunities. But there will probably be few classical guitarists who admit that the cross-over is … “best” in this area, but here, only personal preferences and habits matter. The purists among classical guitarists will without doubt not be convinced by these transformations, but after all, they are not the intended target players. The first notes have a much fuller sound, with a nice balance between the bass and treble. The basses support the melody without covering other frequencies. The result is a sound picture full of warmth and well balanced. Compared to the 4P S, the LR CW CS-S Series has a sound that is a little brighter in the trebles, and the sound is a little clearer, without becoming fractious or sharp. The sustain is excellent, and it is quite suitable for playing solo parts. The bass strings support the melody without any problems, and well-balanced sound is present here too. There is not a single frequency range that dominates the others, and the guitar is very handy. Indeed, in sound, there is little or no difference with a “real” classical guitar. The projection of the sound is excellent. If we play purely with our fingers, everything is already good, but once the attack is accentuated, either by the nails, or why not, a pick, the true character of the instrument is revealed. The ‘crossover’ feels particularly at ease with a pick, maybe it is the more “electric” model size that makes this happen? This guitar is not the first to fulfill the principle of ‘crossover‘ in Alhambra, but it’s still great to see a new model emerge. The idea behind the slight dimensional change is almost immediately on how we play. And from these minor changes, the effects are much more important than you might anticipate. I therefore appeal to all acoustic and electric guitar players who want to add an additional colour to their arsenal, but have always been put off by the classical guitar: now’s the time to grab your chance! Posted in Acoustic Guitars, Classical guitars, electro classical guitars, electroacoustic guitars, Flamenco guitars, flamenco instruments, guitar, Guitar manufacturers, guitar music, Guitar players, musical instruments, Spanish guitars and tagged Acoustic guitar, alhambra, alhambra 4p, alhambra acoustic guitars, alhambra crossover, alhambra crossover cs3cw, alhambra crossover review, alhambra crossover series, alhambra cs lr cw, alhambra cs lr cw s series, alhambra cslrcw, alhambra electro classical guitars, alhambra electro guitars, alhambra guitars, alhambra guitars france, alhambra guitars uk, alhambra guitars usa, alhambra s series, best classical guitar, best flamenco guitar, buy flamenco guitar, buy spanish guitar, classical guitar, crossover guitar, electro classical guitar, flamenco guitar, flamenco guitar electro, flamenco guitar price, gitarre alhambra, Guitar, guitare alhambra, guitare classique electro, guitarra alhambra, guitarra alhambra crossover, how to buy spanish guitar, spanish guitar, Spanish guitar making, Spanish luthier. Bookmark the permalink. Great information about that alhambra guitar brand and I also see that, this guitar brand also makes a great acoustic guitar. HAVE OWNED THE ALHAMBRA CUTAWAY FOR ABOUT TWELVE YEARS PLAYING BLUES ON LA BELLA MEDIUM TENSION FLAMENCO STRINGS, FANTASTIC SOUND AND A FANTASTIC GUITAR, SUPERB TONE AND ACTION.